Hey Steve, if you're reading thru this, i finally got the Eurofighter set up. Love the board. Here's my honest review for ya. Cool flat finish...industrial looking, almost like colored primer. Only thing is i noticed that et got dirty easy, so i polished it a bit and it kept the finish, but fingerprints rub right off now. Great camber, the wheelwells are well placed and the added room for the front foot is smart. I had to put a concave on it. By American standards the board is very small. I mean, this is the land where GS and 36" boards are king, so at 28" it was pretty small, but with the concave in front along with a toestop.....and a kicktail in back that wraps around the sides a little making a sort of "pocket" for the rear foot, it's very easy to get my footing. I drilled it out to 19" and it's a great TS board....cant explain it, it just seems to snap back quick and feels "solid". Set up with a wedged Radikal in front, PVD in rear and i have trimmed Avalons on it now, it's a fine little set up. Congrats, Chris. That is certainly a sweet ride no matter what the costs. 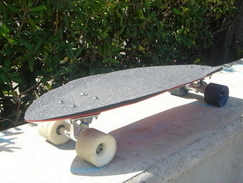 Thanks again for the review - I'm glad that you are stoked on the board. If anyone wants a longer/wider version of any of our classic shapes, including the Eurofighter, our custom shop can do this. Albeit at a slightly higher price! That's sweet! 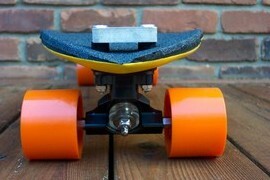 I dig the orange wheels with the yellow board. I am particularly pleased that you like it, as it was my pet project when I was with Turner. Here is what mine looked like after using a little foam on the nose. This was how I had it mounted. I did actually have an early version of it at Morro, but having never ridden it, I didn't want to hurl myself down the Super-G on something untested, apart from which I had just won in Antibes on my Roe 34". Give yourself about 5 years and i know you'll understand the reasons for both, aye? Speaking of which, all's well with Maya i hope?....is she home with you yet? Yup, I designed them both... 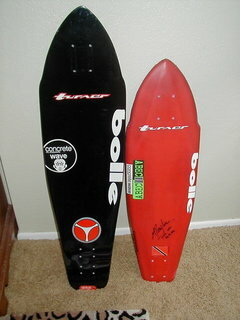 I have a Roe built 34" custom board that is similar and on my next version the tail will be a little wider - Can't wait! I fully understand about the priorities and expense. Morro Bay is the reason that I have sold so much of my old stuff recently, trying to make it a family trip! As for Miss Maya, she has been home 3 weeks now weighs 9lbs and is perfect! Damn Martin...Maya look like papa!! I too have tapped funds kidz will bankrupt ya'!! Well worth it tho! We spent 10 daze on the outter banks, 1 week in Morgantown..2 weeks of soccer camp and today I am taking them up to Grandpa's to spend a week w/ their 85 year old Grand daddy!!! Haven't been skatin much, but trying to pull Chi Town down..And gonna get Steven to build me a Euro! I remember a while back asking him to build a Deck w/ roleed edge towards bottom..he checked w/ the shop and said it'd be difficult and not for a while! Now's the time!!!!!! 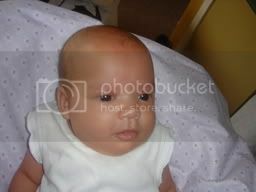 Cute lil' girl you have there....looks healthy as all get-go too....you and the missus are blessed for sure aye? 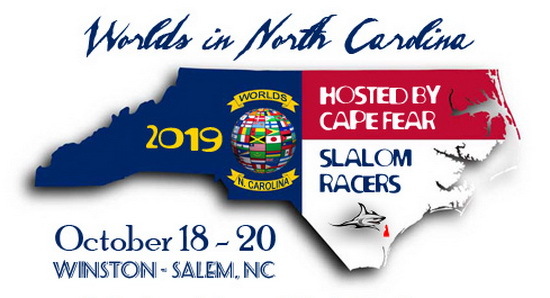 Mr. Gale.....it's been a long time since i touched base with ya.....i'll try to drop you a line before this weekend....hopin' to see you in Chicago....if not, we'll be driving down to the smokeys for bridge day....save us some floor space! The Euro got great reviews in Chicago. Some said it was a bit small under foot....and it does take some getting used to. But it felt comfortable down the ramp and around the cones. Great acceleration. I still need allot of work on my game, but i can honestly say that your board made me a better skater that weekend. Chris, don't get me wrong, I would NEVER diss Turners. Personally I don't think there are many boards out there with the elegant lines of the Eurofighter and I'm glad its receiving the praise that its due, under your feet!...They have a magic about them few can match. All I was trying to say was I prefered to ride a board in a high speed Super-G that I had ridden all Summer and won a big race on, in preference to a board I had only ridden 100 yards (even though I had designed it)! Plus this was with Steven's blessing as he is a very reasonable and understanding man. nah, i knew a gentleman like you wouldnt be trashtalking your old team like that....and i see you're point exactly....and i think riding that lil' board thru a Super G would be completely insane....though i saw Jadranko put a 28" board down Trade Street, i dont have the Canoles to do that. Yep, it's nice to see the new boards work so well.....now it'd be nice to see a Team Turner surface again in 06 aye? Chris let me try out his Turner EuroFighter at the Chicago race, very light weight, extremely manuverable and quick. Wise investment Chris. Truly a work of Art. Eddy Texas Outlaws. I got this from Dan Gessmer in Boulder on Monday. wow is that beautiful.......is it a Turner?.....never seen anything like it!...what's the dimensions? More kick in the tail please. It is a good looking ride. What type of construction? 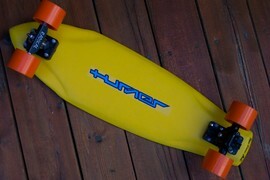 Does anyone know a good place to get a couple Euro Turner Prototypes and a Wefunk drilled? 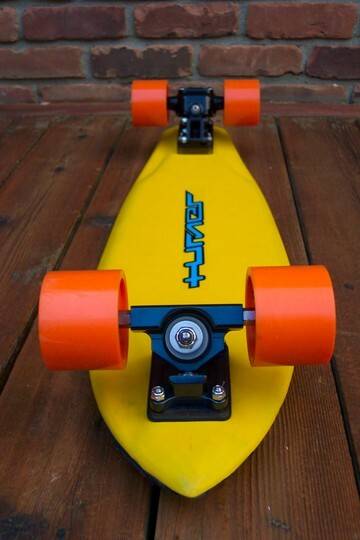 I've never ridden the yellow board and I really want to. Any suggestions on setup? 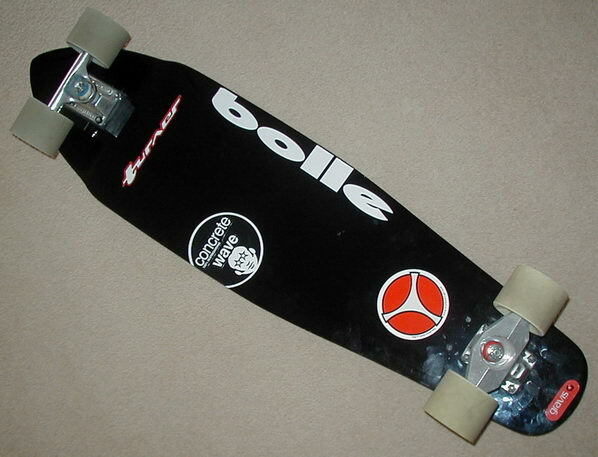 I was thinking Radikal front, Gtruck bushings and a DS 90 rear 50? baseplate with Stims and Avalons all around. Last edited by Karl Floitgraf on Wed Jan 11, 2006 12:10 am, edited 1 time in total. Boards are getting bigger.....Turners should to. and you need outlets to sell the boards....if it's too difficult to buy, people are going to go to another product line. In the old days, for a foamy, you had Turner and Ick....Now you have about a dozen companies, all with a quality product.....There's a place for Turner in the mix, for sure. This board i have is exceptionally well made, but not easy to come by for most folks. Could someone help me out on where I should have the board drilled too. So what are the goodies locked up ? ?